Our goal is to create a mobile app that uses technology as a tool to teach people how to thoughtfully engage critical thinking skills to effectively communicate with people of differing belief systems. We believe that it is our social responsibility to help teach individuals how to employ philosophical tools in general conversations to bring about effective communication. Bridging together the two worlds of technology & communication, our app will bring sustainability to our technologically immersed society in it's ability to foster cohesive & cooperative relationships between diverse individuals. Dr. Peter Boghossian is a full-time faculty member at Portland State University, working as an Assistant Professor of Philosophy. His research focuses primarily on critical thinking, philosophy of education, and moral reasoning. In 2013, Boghossian coined the term street epistemology as a set of techniques that an individual can use in personal conversation with those who have unsound belief systems to help them dis-engage with those said beliefs. Upon the creation of these techniques and the publication of Boghossian's first book, independent Street Epistemology groups have been created around the world, in an effort to bring the street epistemology method to the public. An example of how a conversation using street epistemology would be constructed. 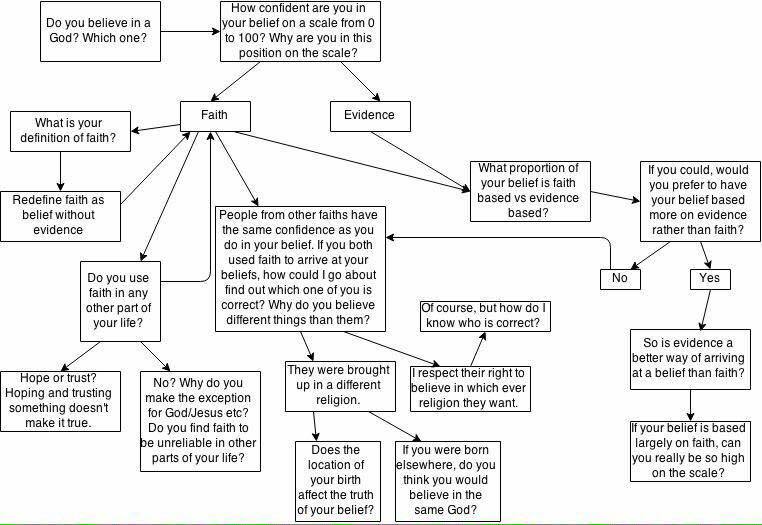 While this diagram uses religion as it's main subject, street epistemology can be used in conversations about many different beliefs. Atheos is the culmination of dozens of volunteers working tirelessly for the last year to bring the techniques and tools that make up the practice of street epistemology to the pocket of any individual who needs it. We hope to help change the conversations we as a society have into being respectful, kind, productive & cooperative rather than malicious, aggressive, & self-serving. I stumbled upon this project after taking Philosophy courses at Portland State University and began working with Dr. Boghossian on various projects in 2013. I began my work on Atheos as a tester, and soon was promoted to director of testing, and then project manager. My interest and passion for this project lies in the desire to create opportunity for people to engage in cooperative & productive communication even when it seems impossible. As a Sociology major, I watch intently as the society that I live in crumbles around me due to the inability of those in power to be able to engage in real conversation with each other - whether they differ in political, religious, or ethical beliefs. This is something that is seriously destroying American society, especially as America's civil rights issues reach such a tipping point. If I can help to make one iota of a change in teaching people how to work together to be effective change agents through effective communication, I would be overjoyed. I feel as though Atheos can help do just this. Atheos helps individuals recognize a universal truth that we all share: none of us have all of the answers, none of us know everything, and the unknown remains the unknown. Atheos plays as a game where the user is a "reason warrior" sent by Socrates to free his peer from the shackles of Plato's cave. Through various quizzes that test critical thinking, logic, conversational, and ____ skills, the user can win the game by freeing the prisoner from the cave. Throughout the process, the user earns awards and tiles that unlock extra content with contributors ranging from Dr. Richard Dawkins to Jerry Coyne. Working on a critical thinking mobile app remains so important to me today because this is the first real project that I feel that I have been able to be a part of that could really actively influence the lives of others. Our app, hopefully, will be successfully used to teach people how to engage in thoughtful, respectful, and effective conversations with those who differ in belief systems from their own. I am most excited to see the responses to the app and to hear personal stories from people about how the app has helped them in their everyday life. While I look at the bigger picture of believing that thinking critically and communicating are vital parts of our society, they are even more vital in our ability to have good relationships with those in our own personal world. I hope that people have the ability to use the tools that we teach them to talk to someone who they never thought they would be able to, and to come out on the other end of the conversation satisfied, relieved, and excited to go and talk to the NEXT person. If we could create a chain reaction of people feeling as though they have the ability to effectively communicate with anyone that they choose, I will feel as though I had been an effective change agent. I hope that our app helps people learn that we can be capable of%"0exaei.ing and criticizing all beliefs while still engaging in productive forward-moving conversations that can effect change. As a society, we have become so polarized that we are having serious issues being able to come together, put our differences aside, and make effective change for the future. People would have a tool-set in their pocket that would teach them how to effectively engage in any conversation they may run into. I hope to continue with the momentum that I have gained through this course. My motivation at the moment seems higher than I have ever felt it before. I think most of it is the inspiration I have gained from my fellow students in this course, as well as the feeling of accomplishment and relief that I have for finally finishing my undergraduate degree. I feel refreshed and ready to enter into the real world -- I did NOT feel this way for most of the year….fear is what comes to mind -- and I’m hoping that I can find work in the future that will pertain directly to effecting change.